One frequently hears complaints from America of people who encounter panhandlers. The panhandlers, they note, are often aggressive, insistent, and abrasive. Many cities have made efforts to control these people in an effort to protect their citizens from being hassled. 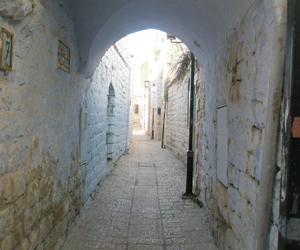 Nothing could be farther from the realities of Tzfat. It is true that in Tzfat, as in all of Israel, the percentage of people begging for handouts is quite high. But the idea that they could be aggressive couldn't be farther from the truth. Anna* generally sits outside the town bakery. She was, she tells people, once an English teacher in her native town in the former Soviet Union. She immigrated to Israel more than a dozen years ago, and is unable to make her small pension stretch to cover her basic expenses. So she sits outside in all types of weather and asks for change. Anna was once part of the "intelligentsia" in Russia, and her manner shows it. She reads in-between asking for assistance, and can expound on subjects as diverse as Russian literature and various philosophies. Anna once mentioned that she lives farther north, but comes to Tzfat because the people here are so generous. "Even when they don't have much, they share" Anna has said. "It's not like that everywhere". Ya'akov* is another regular on the main street. He has a chair which one of the shops stores for him, and he arrives daily to sit outside the pharmacy with little knick-knacks that he sells. The small plastic bracelets and necklaces are worth pennies, but even so, few people buy them, so he passes his time by reciting psalms. When someone passes, if he can catch their eye, he offers them a blessing. "What's your mother's name?" he asks. With that information, he blesses the person, asking only for a few shekels in return. Since most people like the idea of an extra blessing (after all, it couldn't hurt) he stays busy, as long as he can find people who have the extra minute to stop. Ilya* is another immigrant from the Former Soviet Union. He has been a regular on the street for many years, and whenever anyone puts some coins into his cup, he bows his head in a gentlemanly old-world manner. In-between his walks up and down the street, he discusses chess with some of the Russian street-cleaners. Aryeh* is a favorite in the Old City. He stands outside one of the famous old synagogues in the Jewish Quarter and collects tzdekka, charity, while teaching tourists about Torah and Jewish texts. "You know what it says about the Sabbath?" he asks one tourist. "It says 'Keep the Sabbath Holy'". Even after the tourist has given him some coins, Aryeh continues. "We Jewish people are obligated to keep the Sabbath, to honor it, and to respect its laws. After all, that's why we're all still Jewish today." Although the tourists want to keep moving, something about Aryeh's discourse fascinates them. Or maybe they appreciate that he's 'working' for his pay. At any rate, he's become as much a tourist attraction as the synagogue itself. Perhaps panhandling is looked askance in other parts of the world, but in Tzfat, the beggars are as much a part of the character of the city as any of the tourist sites that people come to see, and the residents of Tzfat would have it no other way.